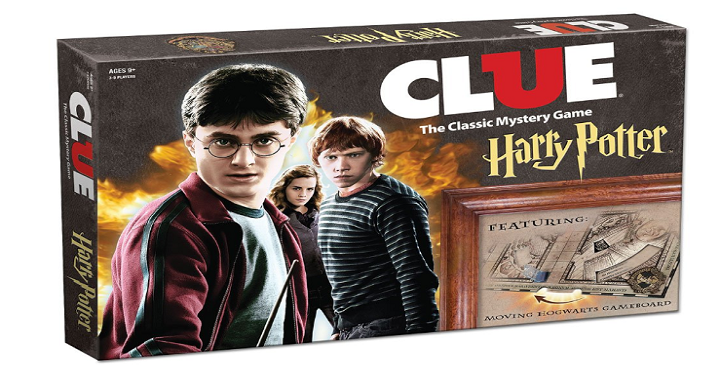 Harry Potter Clue Board Game Just $33.71 Shipped! How awesome is this? Right now on Amazon, you can get this Harry Potter Clue Board Game for Just $33.71 Shipped! It’s a mystery at Hogwarts with CLUE: Harry Potter. A fellow student has seemingly vanished from the famous School of Witchcraft and Wizardry – and it is up to you to solve the mysterious disappearance. Playing as Harry, Ron, Hermione, Ginny, Luna or Neville, you must try and discover who did it, WHAT spell or item they used and where the student was attacked. Move around Hogwarts making suggestions…but watch out! Wheels on the board will keep changing revealing secret passages, moving staircases or even the Dark Mark! Protection from the Dark Mark comes from the spells, allies and items provided by the Help Cards. When you’re sure of your facts go to Dumbledore’s office to make your accusation and win the game!